6’+ Episode 166 is Up! 6’+ Episode 167 is Up! 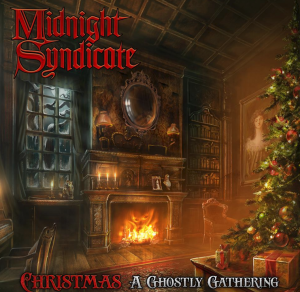 After numerous requests for such an album by fans, Midnight Syndicate has finally released their very first Christmas album! It’s something of a departure from their usual work in more ways than one. Aside from the obvious difference, the band has stressed their efforts to appeal to as many kinds of listeners as possible while still seeming like a Midnight Syndicate album in their various social media feeds. The loose connection between the tracks is rare among numerous albums which tell complete stories through their tracks. In other words, there’s plenty of styles to be found in this selection of old favorites and new material. The beginning of “Christmas Overture” has a pleasing, dreamy feel thanks to its use of chimes and touches of jingle bells. But it quickly becomes more disturbing and slow. The tolling church bells, piano work and snippets of organ music go well with the alternating unisex vocals. “Dance of the Sugar Plum Fairy” also starts off soft and beautiful. Just like the last track, spooky undertones and vocals eventually creep in. While it does admittedly have some lighter moments for contrast, the uneven piano version and string work (which remind me of crawling spiders) offers a chilling new twist on a Christmas standard. “Carol of the Bells” is interesting because Gavin Goska opted for a progressive rock influence! More specifically, his arrangement of the track made use of polyrhythms. The militaristic drums add to its epic, sweeping feel. It’s not scary for the most part, with the occasional exception of the vocals. The piano work even feels downright playful! It’s great for your next Christmas party’s playlist. “Night of the Krampus” is one of the album’s several original compositions. It has an appropriately old “European” feel at the opening before adopting a much darker and dramatic tone. I love the string work and jingle bells coupled with the chorus. It’s very chilling and the use of bells hint at the Krampus’ rusty chains and bells being heard late at night. The use of organ and harpsichord with touches of heavy tones make this version of “Angels We Have Heard On High” a must hear! In addition to the angelic choir, it has a somewhat medieval feel to it. Which is appropriate given how it leads into “Greensleeves.” Its mournful and dark opening sets the feel of track. A tolling bell, gongs and tambourine are nicely combined with the occasional appearance of piano work. “Up On the Housetop” should please any fans of Midnight Syndicate’s work on the soundtrack for a little movie called Axe Giant: The Wrath of Paul Bunyan. The pounding, heavy tone of the opening is kept throughout the track and the sneaking notes create the feeling of Santa and his elves being up to no good. You do not want to put this in your playlist for your next holiday party. Trust me on this. “God Rest Ye Merry, Gentlemen” is slower and more subdued than most versions of the song. This is obvious from the very beginning, which features a medium soft opening and chorus of wordless female vocals. The tolling bells are a great touch, as are the later unisex chorus and magnificent piano work. The second half is both beautiful and inspiring. Bells usher in a mournful tone for “Coventry Carol.” Even the less intense parts bring to quiet reflection to mind rather than Christmas cheer. The vocals really add to the overall effect. “Little Helpers” has a deceptively whimsical opening and plenty of jingle bells. The whimsical touches and percussion make the listener think of a wacky workshop full of elves putting toys together. But once you start to hear them, they sound more like goblins or evil clowns. Then they really crank up the sense of menace afterwards. The elegant harpsichord opening of “Sing We Now of Christmas” has some dark undertones lurking in background but does get a bit more cheery as time goes on. It’s utterly fascinating to listen to and I can’t exactly put my finger on why. “Winter Storm” is intense, unnerving and chaotic at times, just like its namesake. I loved the use of lighter musical touches to represent drifting snowflakes. The unusual music which forms “Into the Stillness” makes wonderful use of bells and wordless vocals. The peppy drums and marching opening of “The Parade of the Tin Soldiers” immediately lets the listener know there is something special about this particular take on “March of the Wooden Soldiers.” It’s appropriately both playful and serious thanks to its use of bells and gong strikes. The traditional carol “Everywhere, Everywhere, Christmas Tonight” features organ work and triumphant brass instrumentation. Speaking of “work,” bells get a quite a workout in this. “Christmas At Midnight” closes things out with the sounds of soft piano, bells, organ work and soft winter winds. Its calm and beautiful nature is aided by a choir, which is a perfect touch to a perfect finish. Christmas: A Ghostly Gathering is perfect both for general December listening and all your Christmas haunting needs. Don’t laugh at that last one. Both scary Christmas scenes at haunted attractions and using a wicked winter wonderland theme for haunted attractions when they reopen in December are growing more and more popular. Both situations can make great use of Midnight Syndicate’s Haunted Attraction Registry Program. Imagine the Krampus lurking in a forest of evergreen trees as “Night of the Krampus” plays or wandering through the Abominable Snowman’s cave with “Winter Storm” blaring in the background. Do I even have to tell you what to use for the encounter with “Santa Claws” or the workshop filled with sinister playthings and menacing machinery? Having costumed performers pop out of what seem to be piles of ordinary present will further add to the fun. Although copies can be purchased from a variety of sources, I suggest ordering the album from the band’s website. Not only will this help support them, but it will also get you some free Midnight Syndicate holiday postcards. But you had better act fast since supplies are limited! Special thanks to Entity Productions for the review copy!